I can’t tell you just how amazing it feels to be here in Jerusalem, counting the moments until everyone gathers to launch our Spirit of Israel Community Mission. For a year, we’ve been imagining, planning and promoting – and now we’re here with about 75 neighbors, friends and colleagues from throughout our vibrant, diverse Jewish community, including our dedicated mission chairs Karen & Mark Dern and Adele & Herman Lebersfeld. Arriving early with our trip leaders, we’ve been walking, touring and meeting in cafes. The Mamilla Mall is full of people, young and old, shopping and bustling. Life here is clearly moving forward, as everyone enjoys being in the fresh air under crystal blue skies. All of our community’s day schools and on-campus agencies are represented here, along with rabbis of different denominations. We vary by neighborhood as well as observance, and we span multiple generations. 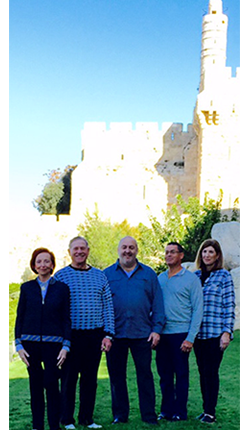 Some of us are first-time visitors, and some have been to Israel a dozen times or more. Our first-rate itinerary holds a treasure trove of experiences that will inform, delight and deeply move each of us. Crossing the country together, we’ll be exploring Israel’s land and her people, her past and her future, and the incredible work of our Federation in Israel. And all the while we’ll be getting to know each other as well as our Israeli brothers and sisters as we travel and lodge, eat and drink, dance and pray together. As a community and as individuals, we have come together in strength and solidarity as we often do, to stand with our Jewish family at another pivotal point in Israel’s history. Our presence here sends a loud, clear and vital message to the Israelis facing their latest challenges, to our own community, and to the world beyond: make no mistake – we proudly stand strong with the people and the state of Israel. As we hope and pray for the peace of the coming Shabbat, we couldn’t be more excited as we begin to experience Israel together. Our beautifully planned mission is sure to be a time of tremendous growth and satisfaction for all of us. We look forward to sharing the highlights in the days ahead. Please follow us on our website and on Facebook. I look forward to your thoughts about strengthening our community and our connection to Israel, at asktheceo@bocafed.org.